One of my teenage daughter’s favorite bands in the Black Veil Brides and I took her up to Worcester, MA to the Palladium for their show about a week and a half ago, billed as The Church Of The Wild Ones Tour. We had the tickets since November as they were a birthday gift for turning 14 so she was pretty excited. I, on the other hand, was not at all. Don’t get me wrong, I always love going to live shows but this wasn’t one of my bands so I was there to support my kid. I do have the band’s first two albums on my iPod but I’ve never given them much attention save for a couple of songs so I didn’t really know what to expect. What I didn’t expect was the extremely long line we had to wait in to get into the venue! It stretched down the side of the building for the better of three blocks and turned right another block getting close to the major concert hall, the DCU Center. I’ve been to my fair shre of shows at The Palladium and I’d never seen a crowd like this, it was almost old school like when I was 14 back in 1984 so I knew that there would be some serious energy in there. The crowd was mostly young kids, ages 12 to 20, a ton of parents with them (like me! 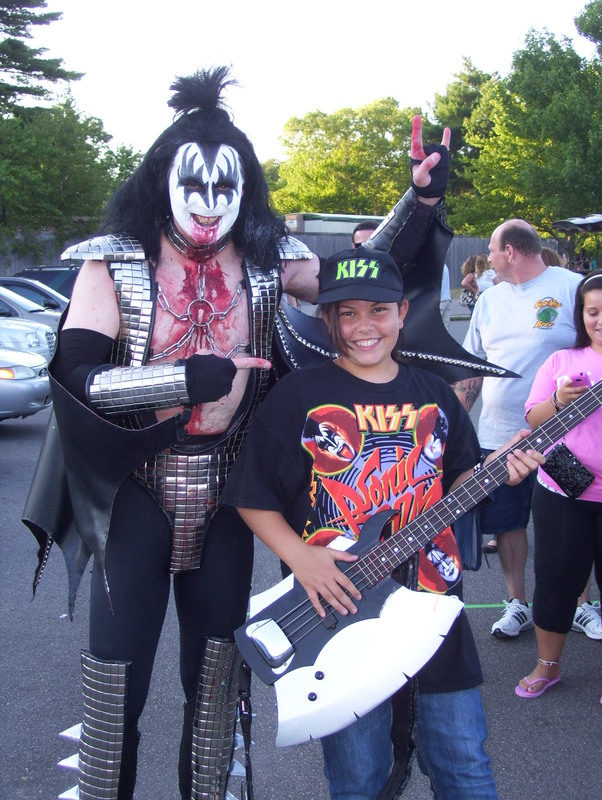 ), and some older metalheads sprinkled throughout. Once we got in, it was off to the merchandise booth to hook my daughter up and the t-shirts were flying off the tables. The place was jam packed for the openers and the kids were getting rowdy…..the lights went down for Silent Season and the place went mental! So the lights go down and the banner goes up for Black Veil Brides and the crowd goes completely insane…..my daughter is screaming and holding back tears and I’m just in awe of what’s happening. Is this how it was back in the day when I started going to shows? 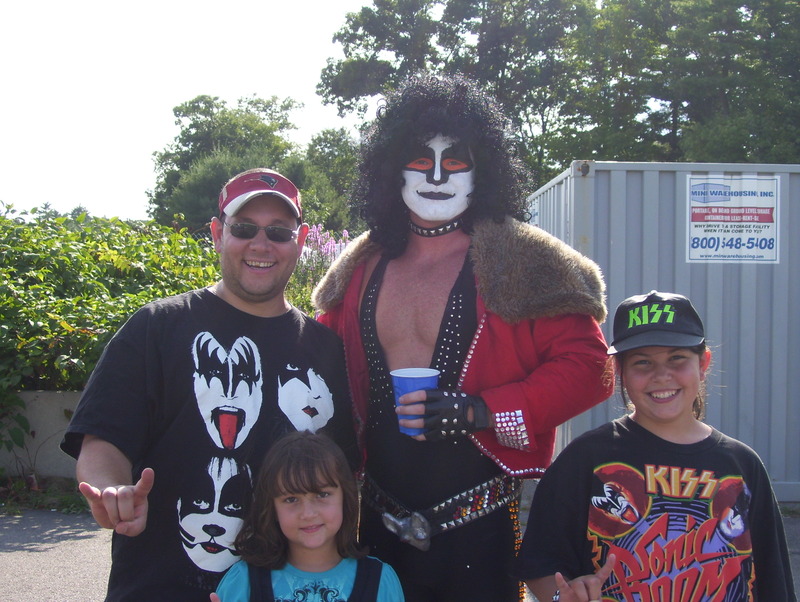 Was I crying at the KISS reunion show in Boston in 1996? I guess the apple doesn’t fall far from the tree! From the opening music of the ‘Exordium’ intro into the opening song ‘I Am Bulletproof’, the 2000+ in attendance were jumping up and down, screaming and singing…..there was so much energy I couldn’t believe it. Before I get into the setlist, let me describe the stage setup and show. The palladium is small so this wasn’t an all out production show but the band had a small drum riser flanked by eight rotating lights on stage that really added to the show. A bit of fog and decent lighting from the above rig, there were no fireworks or screens so basically it was the lights and the band’s own merits to carry the performance. For a young band, it’s better to stand on your performance, that way you can win over some new fans and keep the respect of your current fanbase. I’m sure if BVB makes it to larger arenas, they will enhance their show. now because this is a general admission arena, I was glad to see the band had a stage length riser up front that the band could stand on so everyone could see them, this way the floor gets what the raised floor and balcony got. 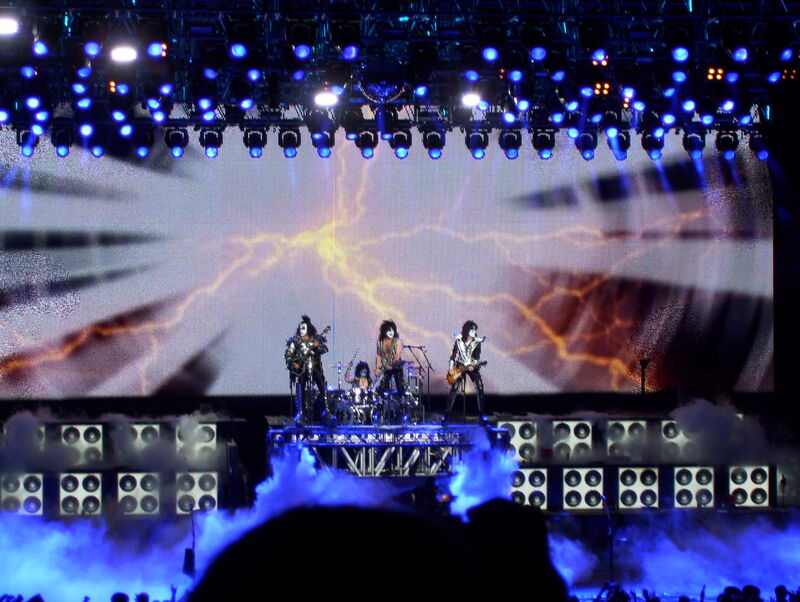 There was also a simple Black Veil Brides banner that went the length of the back drum riser, a simple backdrop and the band had their costumes on that reminded of Motley Crue circa 1984. The band was completely energetic and held the crowd in the palm of their hand. It did remind me of the Crue in ’84 or Guns ‘N Roses in 1987, they had that kind of command at the throngs of teenagers screaming every word. Thank god for Setlist.fm or I wouldn’t have known most of the songs. The crowd did and they sang every single word, at one point I tried to interrupt my daughter’s emotional screaming to ask what song it was and she abruptly ignored me! I’ll be honest, I didn’t expect much from the band but they play so well and so tight that I became a fan by the end of the show. For a bunch of guys in their early 20s, they played like seasoned veterans, absolutely great musicianship, that’s what won me over. I did know a few songs from my sporadic listens to their first two records (‘Knives And Pens’, ‘Fallen Angels’ and ‘Youth And Whiskey’) and I also new a couple new tunes from the new album, Wretched And Divine: The Story of The Wild Ones (‘I Am Bulletproof’ and ‘Resurrect The Sun’) so they were all highlights. I was surprised to hear the band do a cover of ‘Rebel Yell’ by Billy Idol but they did a really good job staying true to the original while beefing it up just a bit to the modern Metal standards. After the band left the stage, the crowd continued to go nuts and BVB came out to play a two song encore: ‘Fallen Angels’ and ‘In the End’. The venue exploded for ‘Fallen Angels’, which I assume is there signature hit, and it was the song of the night for me and there was a quick guest vocal from the singer of William Control (who I just figured out is named William Control). All in all, a solid concert. All the bands played really well, it’s good to see a new generation of bands grabbing the Metal torch and giving the fans some high energy music. I’ll be checking out Silent Season’s CD and I’ll be giving the Black Veil Brides a little more time…..not sure about William Control, not my thing but they were a good alternative for an opener. It’s always good to open up to something new and I’ve got my daughter to thank for my discovery of two new bands. It’s hard to believe that it’s been four and a half months since I went to a live show but I was able to kick off my 2011 concert season with a trip to Boston to see Bon Jovi in concert this past Tuesday night. I’ll be very honest, I’m not a huge Bon Jovi fan. Back in the ’80s I was, especially from the first album through NEW JERSEY (1988), and I saw them live at the Providence Civic Center on both the SLIPPERY WHEN WET tour (with Cinderella) and the NEW JERSEY tour (with Skid Row). Anything after NEW JERSEY has never been my high priority list although I do have a few of their most recent albums, including THE CIRCLE (2009), and I caught them in concert back on the CRUSH tour in the Summer of 2001. The main reason I went to the concert is because I was taking my wife and Bon Jovi is her favorite Rock band. She has seen the band multiple times over the last few years including seeing the band on their home turf in New Jersey. Bon Jovi is to my wife what KISS is to me and I decided to go with her when tickets went on sale in November 2010…..$177 dollars a piece after all the Ticketmaster fees! I’ve had the opportunity to see the band on previous tours but I swore off all Bon Jovi shows because of the show I saw in Summer 2001 supporting CRUSH. Nothing kills it for me than cover songs and Bon Jovi ended that concert with a cover of ‘Tequila’ and ‘Twist & Shout’ instead of reaching into their own catalog for something off the first two albums…..’Runaway’ maybe? That show was great until the last two songs and I was so disappointed that I haven’t seen the band live and I’ve been ultra-critical of them since. Eight years is a long time and Bon Jovi is selling out stadiums when many of their contemporaries and peers have trouble selling out theaters so it’s safe to say that they are as popular as they ever have been. My curiosity got the better of me and I got pretty psyched to see the band live after all these years, plus I heard they mix up the setlist from show to show! The concert was billed as “An Evening With Bon Jovi” so there was no opening act but that meant that there could be a possibly longer setlist, maybe a 2 to 3 hour show! I have to say, I was pleasantly surprised that I enjoyed myself as much as I did, especially after I didn’t like the THE CIRCLE. The band did play three songs off that album (‘We Weren’t Born To Follow’, ‘Love’s The Only Rule’ & ‘Work For The Working Man’) and got them out of the way quick. The show opened with Jon Bon Jovi on a small stage behind the soundboard at the back of the arena (Paul Stanley style) right in front of us singing ‘Last Man Standing’. After the song, JBJ ran through the crowd (with security) to the stage to kick the frenzy into high gear with the classics ‘You Give Love A Bad Name’ and ‘Born To Be My Baby’. So far, I’m good even though I didn’t know one word to ‘Last Man Standing’. I knew ‘We Weren’t Born To Follow’ and ‘Lost Highway’ but not ‘Love’s The Only Rule’ (from THE CIRCLE) but all three songs sounded pretty good live so I made a mental note to revisit THE CIRCLE to see if I the album might benefit from a fresh listen and a note to find the LOST HIGHWAY (2007) album at a cheap price. The show was basically going along fine, and the band sounded pretty good, until they launched into another CIRCLE song ‘Work For The Working Man’. The band got maybe 15-20 seconds in and you heard a big “pop” and there was no sound. Either the speakers went or something happened at the board but the arena, save for maybe the people up front, heard nothing. Of course the band played on being able to hear themselves through their in-ear monitors but they stopped halfway through and left the stage. After about 5 to 10 minutes, the band returned to massive cheers and kicked the show into high gear with ‘It’s My Life’. One of my personal highlights was ‘Runaway’, the band could play anything off the first two albums and I’d be happy even though I’d prefer ‘She Don’t Know Me’ from the first record. I also was psyched to hear ‘Just Older’ from CRUSH, an album I really enjoyed when it came out. ‘We Got It Going On’ sounded decent and the crowd seemed to like it (another reason to check out LOST HIGHWAY) and then it was a double shot of NEW JERSEY tracks ‘Bad Medicne’ and ‘Lay Your Hands On Me’. ‘Bad Medicine’ is a trademark Bon Jovi classic so I would have preferred a more rocking performance without the cover of Roy Orbison’s ‘Pretty Woman’ attached. ‘Lay Your Hands On Me’ is one of my favorite Bon Jovi songs so I was psyched to hear it but Richie Sambora took over the lead vocals while Jon went backstage for a quick break. A well-deserved one too because JBJ was all over the stage and sounded great vocally. I was a little disappointed with Richie’s vocal on ‘Lay Your Hands On Me’, maybe it’s age but his voice wasn’t as strong as I’d remembered. Actually, Richie’s trademark background vocals on many of the songs during the show weren’t really that great. The other thing is that the youthful fire that the original songs had seemed a bit dim live this show, maybe it’s because the band has gone on a different direction musically over the years? Mybe it’s because the band has matured a lot more since 1986-1988? It just seemed like the classic songs from SLIPPERY WHEN WET and NEW JERSEY lacked some of that energy and seemed to follow the sound of the newer songs. After Richie was done, Jon returned to sing ‘Hallelujah’, the Leonard Cohen cover that I think was on a live DVD the band released recently. It’s a good song and JBJ does a decent job but all I can think of is Shrek! I’m not big into Bon Jovi ballads so ‘I’ll Be There For You’ and ‘Bed Of Roses’ were boring for me but the throngs of ladies and Bon Jovi diehards (mostly women) seemed to enjoy them, the songs sounded decent live. Including ‘Bed Of Roses’, the next six songs were from the KEEP THE FAITH (1992) and HAVE A NICE DAY (2005) albums, both of which I don’t own. I always liked ‘Who Says You Can’t Go Home’ and that was one of the “newer” songs I was hoping to hear, ‘I’ll Sleep When I’m Dead’ got the crowd going but I didn’t know it…..I liked the cover of The Rolling Stones’ ‘Start Me Up’ attached to it better than the actual song! ‘Have A Nice Day’ is another “newer” Bon Jovi tune I knew and wanted to hear, very catchy and came off good live, same with the other title track ‘Keep The Faith’. The encore started with the slow ‘Dry County’ off KEEP THE FAITH which I thought was a weird way to kick off an encore but it fit as the band pushed into the classic ‘Wanted Dead Or Alive’, with Rchie’s subpar vocals. ‘I Love This Town’ surprised me and now LOST HIGHWAY is on my Want List because every song I heard live from that album sounded great and , of course no show would be complete with out Bon Jovi’s signature anthem, ‘Livin’ On A Prayer’. Overall, I had a good time and I kind of feel bad that I’ve given Bon Jovi the cold shoulder when it comes to picking up some of the last few records and seeing them in concert. I enjoyed hearing the classic songs from the ’80s, although some could use some more energy and power like on the records, but I think the “newer” songs were the best of the night. I’m definitely going to have to get out to the record store and try to acquire KEEP THE FAITH, HAVE A NICE DAY and LOST HIGHWAY because every song sounded great. I’m a little surprised the band didn’t take a track from THESE DAYS (1995) or BOUNCE (2002) because the band usually represents every album live…..except for 7800 FAHRENHEIT (1985)! Can anyone tell me why they ignore 7800 FAHRENHEIT every tour? That was a great album and I would guarantee that I would see the band in concert again if they played ‘In And Out Of Love’ or ‘Tokyo Road’. That said, Bon Jovi put on a solid show and I had a surprisingly good time. I went to Ozzfest a few weeks ago at the Comcast Center on 8/24…..I’m just getting around to reviewing it now because there really wasn’t much to review. Let me explain….. 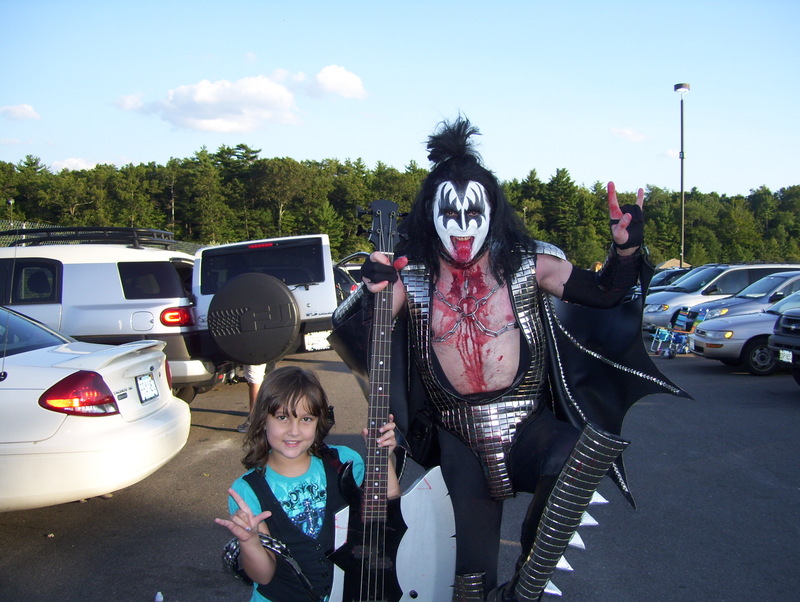 I am an Ozzfest veteran, I have been to the 1998, 1999, 2000, 2001 and 2002 shows at the same venue. Each time I was in as soon as the gates opened and I caught as many Metal bands as possible. When the 2003 Ozzfest lineup was announced, I made the concious decision NOT to attend because of the ticket prices vs. what I thought was a poor lineup. Since that missed show, I didn’t attend another Ozzfest until this year. Maybe it was the small run of tour dates (six U.S. shows) or maybe it was because I was going with a group of friends, either way I put down the $100 for a ticket. None of my friends were interested in the smaller bands so the whole point of going was to see Black Label Society, Halford, Motley Crue and Ozzy. I wouldn’t have minded seeing Kataklysm, Skeletonwitch or Kingdom Of Sorrow but they weren’t top priority. So we get to the parking lot and the sky opens up with a steady drizzle that made the tailgate BBQ nice and soggy but I put up the tent and we had a decent feast. 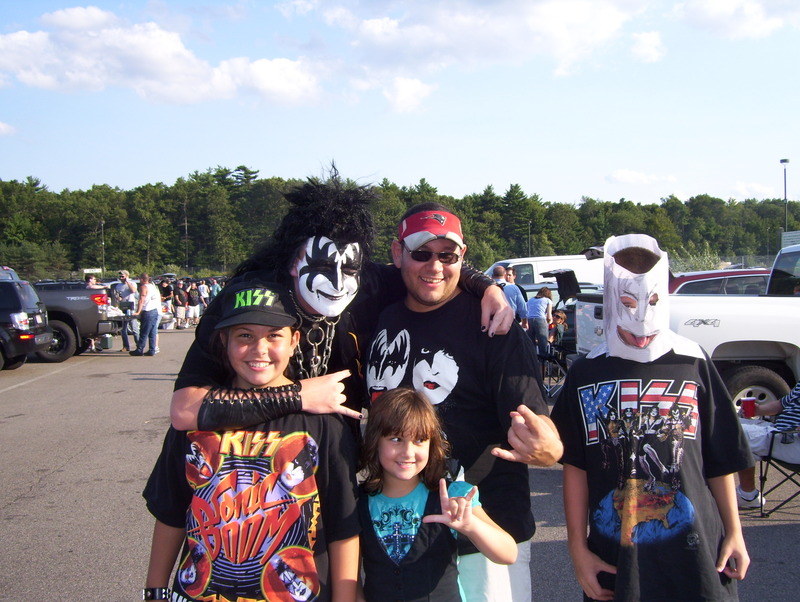 The plan was to head in around 4:15pm for the BLS set at 4:30 on the second stage…..we got to the gate about 4:25pm and found out the entire second stage schedule was cancelled due to inclement weather! Now I have been to Ozzfest many times, and I have been to a ton of outdoor shows in rain worse than what was coming down so I was shocked that a full cancellation was in effect. With nothing left to do it was off to the covered pavilion to our seats so we could dry off a little and wait for the main attractions. I don’t like either band but, I’ll be honest, I also never really heard their music. Actually, I saw Nonpoint at Ozzfest 2001 and I gave the first song off their new album, MIRACLE (2010), a spin when I got a free promo copy from their label. Like I said, not a fan of either band and both performances didn’t help the cause. All I heard was noise and unintelligible shouting and there was nothing extraordinary about Nonpoint or Devildriver for me. That said, I can tell you both bands had large followings and got a ton of applause, I assume that they get played on local Boston radio station 107.3 WAAF and Providence, RI’s 94.1 WHJY. I don’t listen to current Rock radio so I don’t get the appeal but I will listen to the new Nonpoint and review it at some point before the end of the year and I will grab a Devildriver CD if I find it used at a really low price. Like I mentioned before, we were there to see the four headliners but I know I was the only Halford fan. I knew going in that the band was going to play mostly from the Halford band catalogue and maybe we would get a Judas Priest song or two. I am a huge fan of Rob’s solo career so I was psyched to get all the RESURRECTION and CRUCIBLE songs but the highlights for me were the lone Fight track, ‘Nailed To The Gun’, and the new song, ‘Made Of Metal’, from Halford’s upcoming new album of the same name. It wouldn’t be a Rob Halford performance if he didn’t touch upon Judas Priest so he pulled out two deep tracks with ‘Heart Of A Lion’ (a song demoed in 1985 for the TURBO album) and ‘Never Satisfied’ from SAD WINGS OF DESTINY (1976). Those two songs were unbelievable! Turns out that this show was on Rob’s birthday so, at the end of the set, the crew brought out a cake and the crowd sang Happy Birthday to Rob Halford…..a cool moment that ended a flawless performance. Of all the headliners, the one band I knew would definitely get the arena rocking was Motley Crue. I’ve seen just about every tour since the GIRLS GIRLS GIRLS tour back in 1988 and they Crue deliver each time. Forget the fact that Vince Neil sings only have the words most of the time, the band has a ton of hits and always plays a deep track or two in their set and the musicianship is usually flawless. The bottom line is that the Crue put on a great show and this one was no exception. The band came out to the high-powered opener ‘Kickstart My Heart’ and put the pedal to the Metal! Look at the setlist…..it’s just hit after hit along with two songs from their last studio album, SAINTS OF LOS ANGELES (2009), and a deep cut from SHOUT AT THE DEVIL (1983) with the Beatles’ tune ‘Helter Skelter’. I’m an old school Crue fan, I was there at the beginning, so I love hearing tracks from the first two recordsso ‘Live Wire’, ‘Looks That Kill’ and ‘Shout At The Devil’ went over huge with me but I would have liked another track or two…..maybe if the set was longer because you can’t cut any of the other hits out! Like I mentioned, Vince Neil still only sings half the words but he sounds better (if that’s possible) and the band was tight and dead on. I would say the performance of the night fell to guitarist Mick Mars…..it’s hard to watch that guy stand up or walk but he played flawlessly! The other three guys may be the faces of Motley Crue but Mick Mars is definitely the backbone. All in all, I’d say this was a solid performance and the band had the crowd looking for more. Here’s the thing about Ozzy…..his performances are hit or miss. I’ve seen Ozzy mulitple times on every solo tour since NO MORE TEARS (1991) and he is usually really good, the one exception being the 2001/2002 tour for DOWN TO EARTH. As I mentioned before, I’ve seen Ozzfest from 1998 to 2002 and now this one (that’s 6!) and he has performed solo on four of them, each one hit or miss. The two Ozzfests that I saw with Black Sabbath headlining were really great so is it a case of Ozzy being too comfortable in his own material or that ultimately Black Sabbath is more than just Ozzy? Either way, I was excited to see Ozzy because he finally released a new record that wasn’t a letdown, SCREAM being the best album since 1995’s OZZMOSIS. 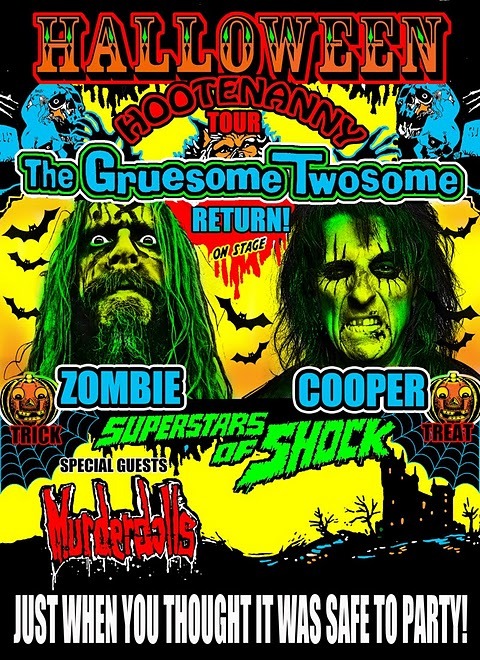 First thing I noticed was that Ozzy sounded great…..he opened with the classic ‘Bark At The Moon’ and his vocals were the best I’ve heard since the OZZMOSIS tour. The new band was really powerful, especially new guitarist Gus G. (Firewind, Dream Evil) who added a new edge to the overall sound. Nothing against Zakk Wylde but sometimes a new member can add a new spark. Same thing goes for bassist Blasko, drummer Tommy Clufetos and keyboardist Adam Wakeman…..these guys all had an energy to them that seemed to revive the Prince Of Darkness to put on an inspired show. The Blasko/Clufetos rhythm section is solid, no surprise as they have worked together in Rob Zombie’s band, giving them a modern sound and Adam Wakeman is a solid keyboardist/guitarist much like his father Rick Wakeman of the Progressive Rock band Yes. If I had to pick a standout performance it would definitely be Ozzy because his singing is much improved this time around but Gus G.’s guitar playing was dead on to Randy Rhoads, Jake E. Lee and Zakk Wylde proving that he is a versatile young guitar player. The setlist was pretty good although a little predictable. All the usual hits were there (‘Bark At The Moon’, ‘I Don’t Know’, ‘Crazy Train’, and ‘Mr. Crowley’) but I was a little surprised by ‘Shot In The Dark’ because usually Ozzy & Sharon dismiss THE ULTIMATE SIN (1986) so much so that it’s the only Ozzy studio album deleted from the available catalog! Ozzy played two deep tracks with ‘Fire In The Sky’ from NO REST FOR THE WICKED (1988) and the excellent ‘Road To Nowhere’ from NO MORE TEARS. As with any Ozzy concert, the setlist had some Black Sabbath songs included…..this time around five but one was a solo section for the rest of the band when they did ‘Rat Salad’ from PARANOID (1970). ‘Fairies Wear Boots’ and ‘Into The Void’ were excellent, so were ‘Iron Man’ and ‘Paranoid’ but I am sick of those two songs after so many years. Bottom line…..one of the best times I’ve seen Ozzy live in a long time!